The Abertis-UPC Chair, with the aim of encouraging research, annually convenes the Abertis prizes. These award the best doctoral theses and the best final works of master or degree of the universities of Spain related to the management of infrastructures and transport services. 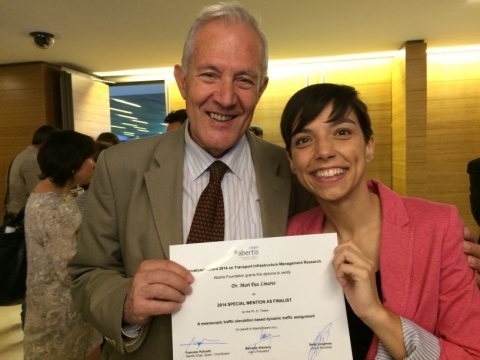 Mari Paz has been awarded for her doctoral thesis: "A mesoscopic traffic simulation based dynamic traffic assignment" directed by Jaume Barceló. And he has also received the mention of the IV International Abertis Prize.